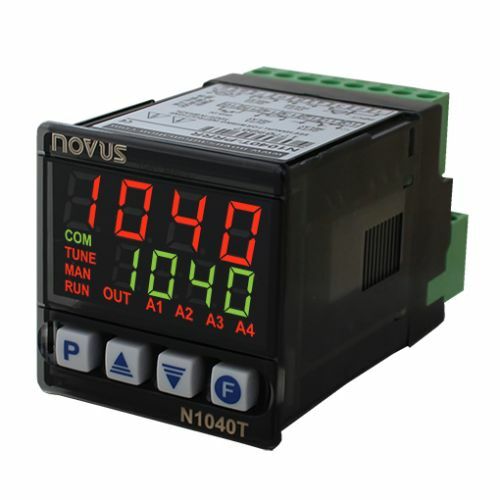 N1040T is an economic and efficient Time and Temperature controller, developed with modern technology and automatic tuning of PID parameters, ON-OFF control and totally configurable. It has a reduced depth flameproof plastic enclosure. It has two independent timers with several operation modes that allow timer association to the controller output or to the temperature control. It accepts Pt100 sensors and thermocouples types J/K/T with decimals on all sensors. It has a fast electrical connection coupler system that reduces installation time. Single model with 4 configurable outputs for process control, alarm or timing. Configuration protection by password and factory calibration recovery.